Perhaps one of Rolex’s most polarizing models to date, the Yacht-Master II is big, brash, and mechanically complex. There are those that love them and those that argue that the Yacht-Master II is the most un-Rolex of all Rolex watches. However, for those that do appreciate the modern size and design of the Rolex Yacht-Master II, there are plenty of versions to choose from. 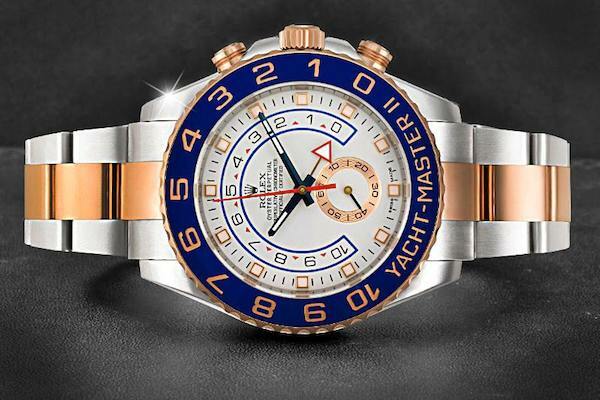 In fact, the Yacht-Master II is a Rolex collection that includes all the metals used by the brand–stainless steel, yellow gold, white gold, Everose gold, and platinum. Let’s have a look at the four versions of the Rolex Yacht-Master II. 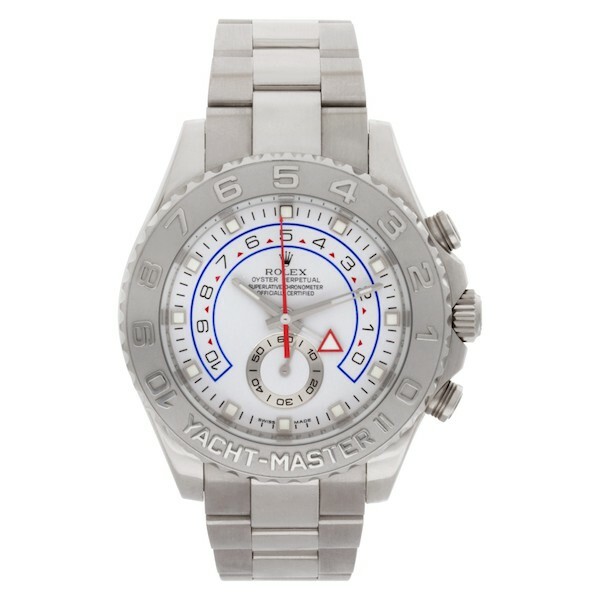 The most robust and affordable of the collection is, of course, the full stainless steel Yacht-Master II ref. 116680. Sporting a 44 mm Oyster Case, the Yacht-Master II is one of Rolex’s largest watches (only the Deepsea is bigger thanks to its thickness) and it comes equipped with an Oyster bracelet. Contrasting with the cool tones of the steel case and bracelet is the Yacht-Master II ref. 116680’s vibrant blue Cerachrom ceramic bezel, which matches the blue details on the information-packed dial. 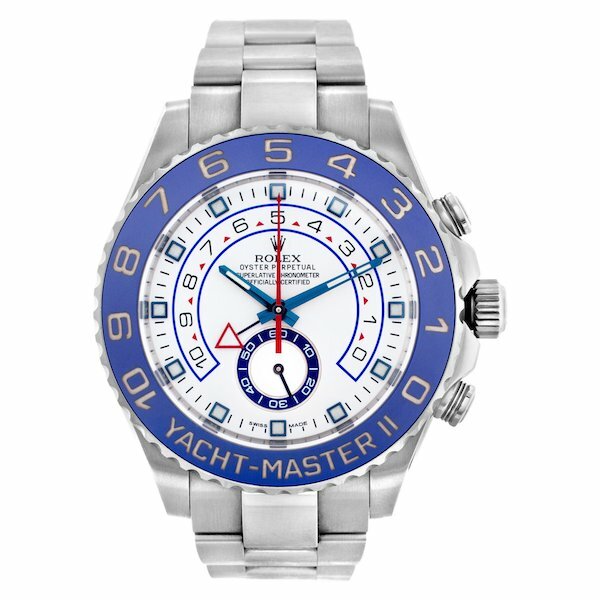 The Yacht-Master II offers a very niche complication targeted towards competitive sailors. Thanks to the Caliber 4161, the Yacht-Master flaunts a regatta chronograph complete with a mechanical memory (up to 10 mins). 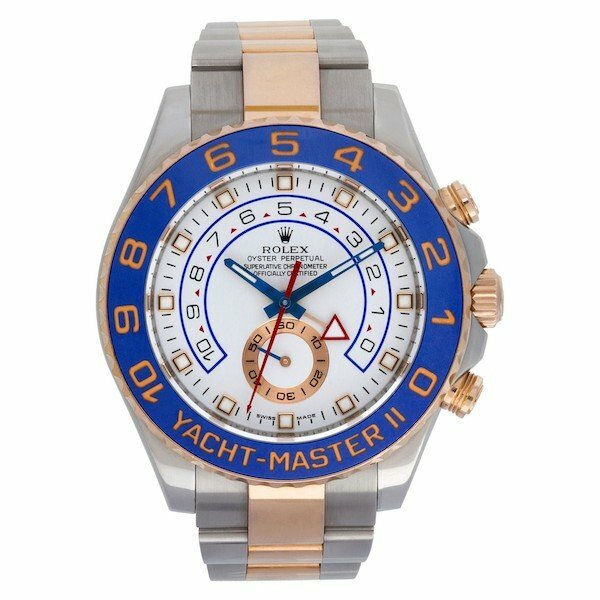 If you’re a fan of two-tone Rolex sports watches, then there’s the stainless steel and gold Yacht-Master II ref. 116681. 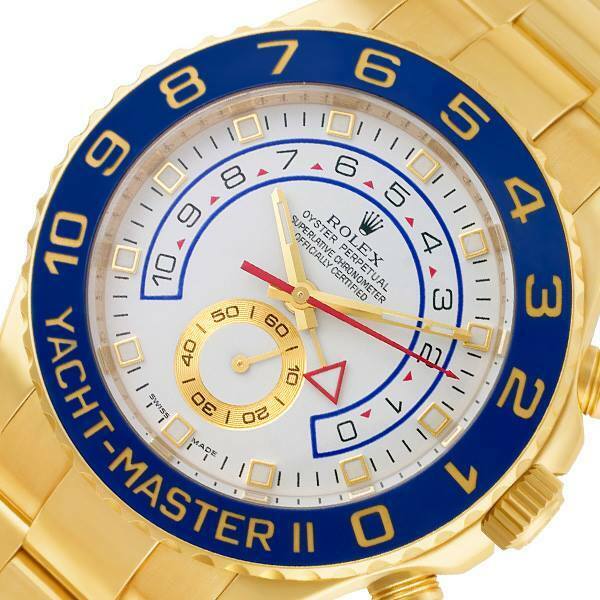 However, rather than using the more classic yellow gold, the Yacht-Master ref. 116681 pairs Everose gold with steel. Everose is Rolex’s patented rose gold alloy that the brand debut in 2005. Fashioned from a proprietary formula, Everose not only offers a beautiful luster but it promises to not fade over time. On the Yacht-Master II ref. 116681, the Everose details are plentiful from the winding crown to the chronograph pushers to the center links on the Oyster bracelet to the bezel. The bezel insert is the same bright blue Cerachrom one, this time featuring Everose gold filled numerals. The dial also includes Everose gold touches, such as the Everose gold surrounds on the hour markers and the running seconds subdial. You’d be hardpressed to find a luxury watch company that makes a better solid gold watch than Rolex. And the yellow gold Yacht-Master II ref. 116688 is no exception. Built almost entirely in 18k yellow gold–except for that signature blue Cerachrom ceramic bezel–the Yacht-Master II 116688 is a status watch that commands attention wherever it goes. In fact, due to its look, size, heft, and price tag, the yellow gold Yacht-Master II ref. 116688 is a favorite watch of celebrities and professional athletes. We’ve spotted actor Mark Wahlberg, MMA fighter Conor McGregor, rapper Drake, and other wearing the solid gold Rolex Yacht-Master II. For an ultra-luxurious take on the professional sailing watch, there’s the Yacht-Master II ref. 116689 which brings together two precious metals. The 44 mm Oyster case and hefty Oyster bracelet are crafted in 18k white gold while the bezel is made from platinum rather than ceramic. 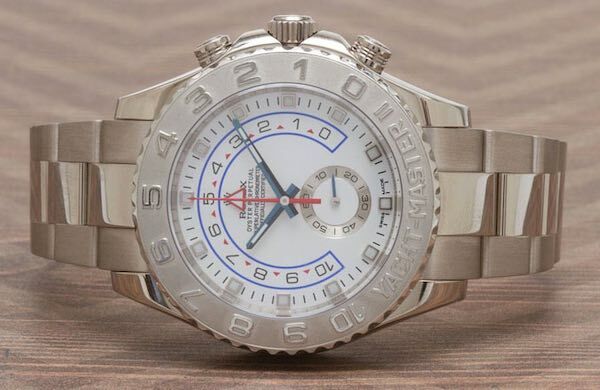 Similar to the metal bezels of the Yacht-Master I watches, the Yacht-Master II ref. 116689’s platinum bezel includes glossy raised numerals sitting on a sandblasted background. These contrasting metal finishes capture the light in a fantastic way, and despite the monochromatic look of the Yacht-Master II ref. 116689, it simply gleams on the wrist. The Yacht-Master II collection is one of the younger ones from Rolex, joining the company’s catalog in 2007. However, just last year in 2007 on the tenth anniversary of the watch, Rolex made some updates. Despite keeping the same reference numbers, the new versions of the Yacht-Master II include Mercedes-style hands instead of pencil style hands. Also new to the dial are the rectangular and triangular indexes at 6 and 12 o’clock, respectively. Everything else remains the same on the Yacht-Master II models. Whether you opt for the steel, two-tone Everose gold and steel, yellow gold, or white gold and platinum Yacht-Master II, this is a Rolex watch that makes a statement–at sea on or land. Thank you for your comment. Rolex only makes the yellow gold Yacht-Master II with a blue ceramic bezel and white dial and I’ve never seen a custom one that’s full gold from top to bottom. Some other options would be a full gold Yacht-Master ref. 16628 with a champagne dial. Or if that’s too small there’s the yellow gold Sky-Dweller ref. 326938 with a champagne dial. Alternatively, if you want a chronograph, there’s also the full yellow gold Daytona ref. 116528 with a champagne dial. Good luck on finding the right Rolex!